Even when you update only the fence and garage, the whole house will still look lovely! In some cases, not the entire house is being updated but only a part of it since that is the only part that needs a transformation or maybe the owners only have budget for that part of the house and would do further renovations soon. We have featured many homes already wherein the interior was renovated or only the exterior was updated. But for the home that we will feature today, only the fence and the garage were given a facelift. 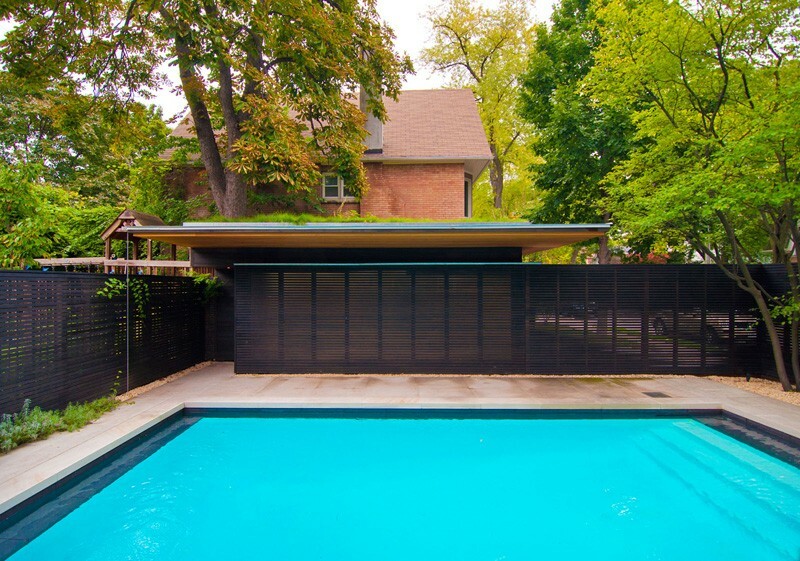 Amantea Architects was commissioned to redesign a detached garage and fence structure for a home located in Toronto, Canada. The original fence has a classic design but it was replaced with horizontal wood slats giving the home a better curb appeal and allowing for privacy. Aside from that, the fence also let light and air pass through it and into the home. It now has a more modern design not just for the fence but also for the garage. 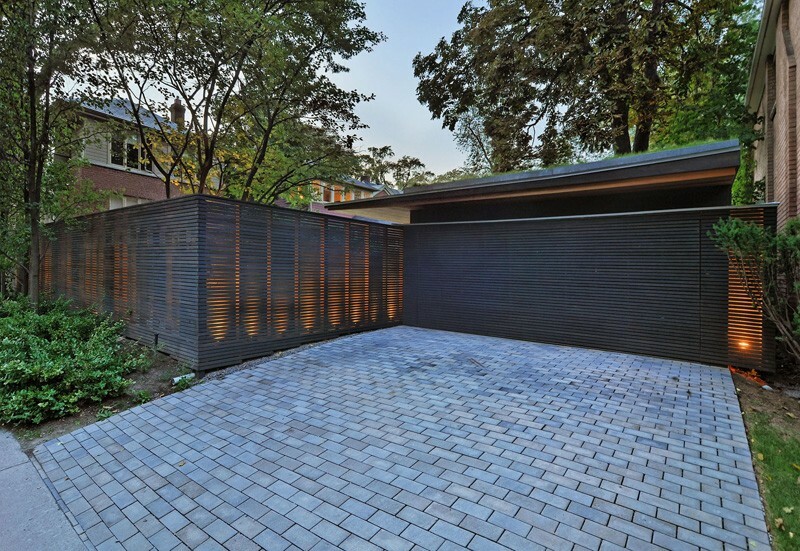 During the night, the fence appears like a large lighting fixture as it provides an ambient glow for the private garden and also to the public sidewalk. If you’ll look into it through the before and after pictures that we will show you below, you will realize that there is indeed a great change in the home. Come and scroll down to page for you to see how much change the fence and garage got that actually added beauty to the home and also upgraded its value too. Unique feature: A two-storey home had a renovation for its garage and fence giving the house a stunning new look. This is a before and after look of the house. Notice that the original fence and garage has a classic look. The garage has a pitched roof and has two doors. The fence looks ordinary to but when it was updated, it looks a lot better with a sleek appeal using the same color with that of the original fence. The garage also changed its look with a flat roof for a more contemporary design. You can see the homes near the house have the classic appeal but I guess that is also similar to the home in within this fence. 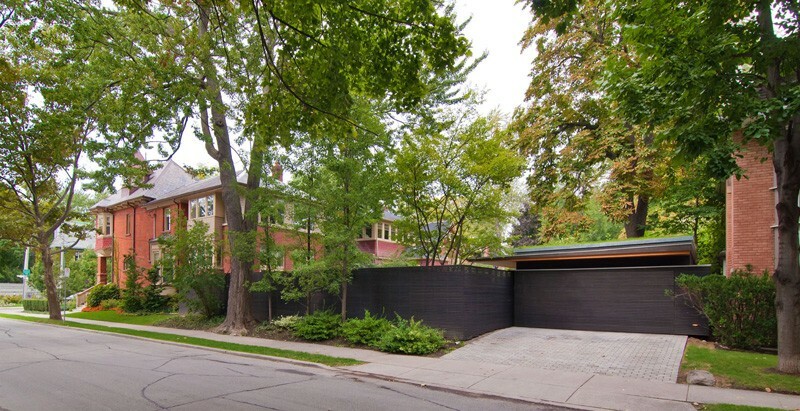 But then again, with a fence and garage like this, one could get an impression that the house is up to date and contemporary or modern in style. Notice the lights inside the fence that looks really nice especially during the night. As what the designers reveal, the fence turns into a large lighting fixture because the light is found around the fence. Also, the pavers that lead to the garage is also updated. When the garage is close, you will think that you are merely looking at a fence but it is actually a large garage door. 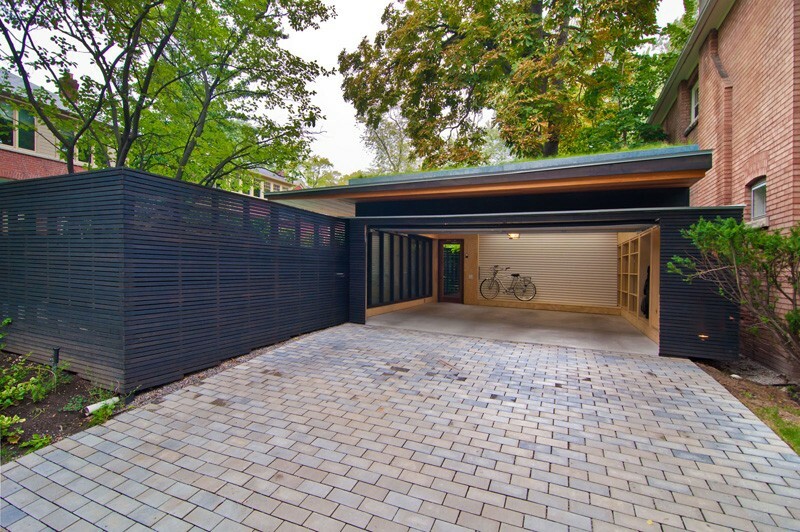 As seen here, it is somewhat a hidden garage door which opens up to a two-car garage space. So, instead of a two-garage door, it has a single large door that leads to the garage area. In the backyard of the home, you can see that it looks better too compared to the previous design because of the updated garage and fence. The fence is somewhat extended to the garage area in order to separate it with the pool. Notice also that the decking of the pool is updated. The area has new pavers on it as well as an extended fence that is like the ones seen outside. At night, this area creates dramatic shadows because of the outdoor lighting, making the space usable even at night. With the new pavers and flooring, the pool looks more inviting and sophisticated. Remember the lights we have been talking about? Now you can see how it works here. When night time comes, the pool, fence, and garage areas can all be lit up and it looks really very beautiful! Indeed, lighting has a great impact to a home! The lighting in the house enables a warm glow that can be seen throughout the space from the fence to the pool. Instead of the green grass lawn, stones were added to the pool area’s deck and flooring which gives it a neater and sleeker appeal that matches with the design of the garage and fence. You can get a better look of the private garden here. I forgot to mention that I like that sculpture that they added in the area. There are also various seating areas here too and also a lounge chair. In this photo, you can also see how the garage has a large overhang and because it is large, a comfy outdoor sofa was added to it where the guests can relax with a good view of the garden and the pool. We have been talking about the updated design of the garage. 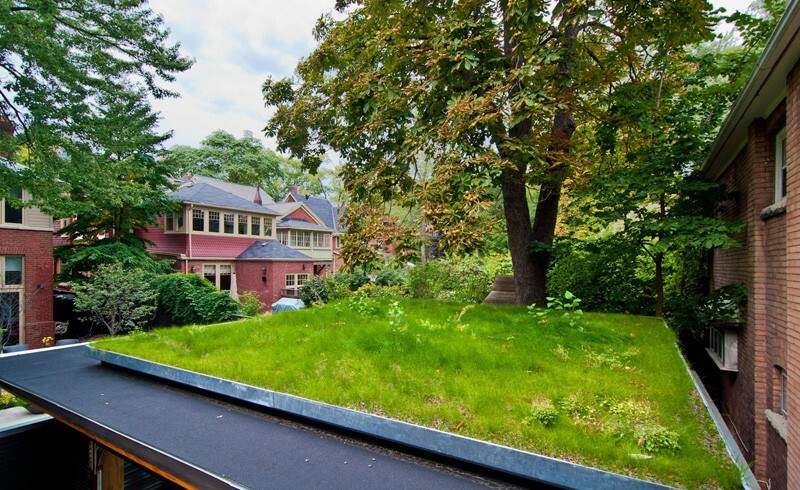 Aside from its new look with a flat roof, the roof also has a garden on top of it which makes it even more special. And it doesn’t just have some bushes and grasses, it also have a tree on it! I guess it would be nice to spend some afternoons under the shade of this tree. You can see that the upgrade has a great impact on the look of the house because it made the garden and pool area appear even more gorgeous with the sleek new look. As you have seen in the photos above, the home looks a lot better and I guess they also added some plants for the landscaping after transforming the fence and the garage. This home renovation is done by Amantea Architects, giving the house a much better look that isn’t just lovely but also trendy as well. If you get to the garden, you will notice that what added to its beauty are the various types of plants that come in different heights, colors and types. And the pool of course is a huge plus! What can you say about this upgrade? Feel free to share your opinion in the comment section below.